5th June - June has started off with it being very rainy, but what else do you expect from the British weather, also had another Terrorist attack this week in London which is very sad. Just proves how stupid some people are. On a lighter note Little Miss P is back to school, and this term is a seven-week term. But then she is off for the summer holidays, I think the summer holidays are six week this year, and for the summer I have no plans. I just hope we get nice weather so we can go to the park lots. It was funny trying to wake up Little Miss P today as she really didn't want to. I think she struggled a lot but so did I. Not the fact that we had to wake up early it was the fact that we actually had to get dressed before 10 o'clock. 13th June - At the weekend we had a lovely weekend. It was a very full weekend but a really fun weekend with my little family. 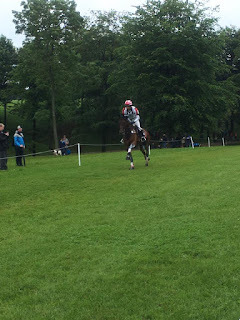 First up we went to Bramham horse trials up near Leeds, we went straight after school on Friday and stayed up at a lovely Hilton (but that will be in a more detailed blog). And on Sunday we went sledging on an indoor Ski slope, we all had a fantastic time. But straight after we were on the road again to make our way home, as we had a wedding reception to get to. We did make it in time and had a lovely time. 17th June - Last week it was so hot as I work outside at lunchtime at the hottest part of the day and I have got myself a little tan. So that's nice but I have burnt myself a little bit on my chest, which keeps coming up in a heat rash, which is really annoying and itchy at the same time. We have just got back from Little Miss P's school fete and there wasn't much there, which I found a little disappointing. Little Miss P went on the bouncy castle twice and we got hotdogs for a bit of lunch. We played a few of the table games like lucky dip and one where you pick your birthday and see if you win the prize. Not entirely sure what that was all about and also name the dog. We named it Bob just for a laugh. Overall we spent about 45 minutes at her school fete just to support them as they seem to need the money at the moment. We are off to Romford in a bit because we need to pick up a few little bits then off to do the joy of food shopping. It's one of those things you just have to do as an adult and you really don't want to.